Happy Friday, everyone! Even though it was a short week in the states, there was no shortage of great content around the blogosphere. Hope you find some nuggets of inspiration in these like we did. Already have a content strategy in place? Ardath Albee offers concrete ideas for attracting more leads and improving response to your content. Scott Brinker explains how three key principles from a new report, Nimble: Publishing in the Digital Age, apply to everyone distributing content on the web. Russ Henneberry challenges companies to stop beating their chests and instead prove their worth by delivering valuable content -- and offers a few examples of how it can be done. Patsi Krakoff dishes out some helpful tips for boosting the impact of your blog posts. Martine Hunter of MLT Creative suggests some ways to boost your creative thinking power. Ever heard of "Absence Thinking?" Doug Kessler recounts the outcome of a very interesting experiment (by a NY Times columnist) in using stories to increase perceived value. Made me think of the old J. Peterman catalog. Interesting stuff. This is a long one, but worth a read. Anthony Piwarun gives an in-depth overview of Johnson Direct's "Direct Branding" + SEO methodology. Jeff Ogden identifies a big pitfall for many companies trying to do the right thing with content marketing, and then links off to some free tools that help mitigate the problem. Mark takes us on a little bike trip off the beaten track, and - along the way - shares great ideas for jump starting your social scene. For even more juicy bits, read the comments. Talk about inspiration and a smart plan. 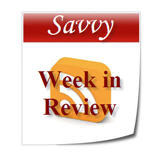 Lisa Petrilli provides some insight into her first week of blogging (which launched last week). Definietly a blog to check out. This is such a valuable service. I love being introduced to new ideas and new bloggers through this weekly round-up. Great job! And thanks so much for including my post! @Mark - So glad you find value. As for including you - I'm finding it hard NOT to include you. Grt stuff this week - as usual. You make it hard to pick just one. Thanks for including my post in your weekly wrap-up! Great collection of articles -- good post-lunch reading. Happy friday Savvy, Scott and Mark! Life is too short to drink bad coffee or waste time on useless content. So I choose to drink the good stuff every morning at work as I start my day reading the latest feed from The Savvy Sisters. I have discovered that I not only get a good buzz from the fresh-roasted, course ground magic beans, I get great ideas from your always interesting and informative articles and highlighted posts from others you recommend. I believe it was discovering the Savvy Sisters that helped me overcome my early reservations about twitter specifically and social media in general. And you haven't missed a beat, or a week, in the two years I've been following your lead. @Scott - Happy to oblige - the "Nimble" piece was worth sharing! this site that anine bing I think it would be a good asset. This is the kind of content that will give clearance to this issue. Thanks for including my post in your weekly wrap-up! Great collection of articles.